This document describes the purpose and general principles of the Genotype Refinement workflow. For the mathematical details of the methods involved, please see the Genotype Refinement math documentation. For step-by-step instructions on how to apply this workflow to your data, please see the Genotype Refinement tutorial. The core GATK Best Practices workflow has historically focused on variant discovery --that is, the existence of genomic variants in one or more samples in a cohorts-- and consistently delivers high quality results when applied appropriately. However, we know that the quality of the individual genotype calls coming out of the variant callers can vary widely based on the quality of the BAM data for each sample. The goal of the Genotype Refinement workflow is to use additional data to improve the accuracy of genotype calls and to filter genotype calls that are not reliable enough for downstream analysis. In this sense it serves as an optional extension of the variant calling workflow, intended for researchers whose work requires high-quality identification of individual genotypes. What studies can benefit from the Genotype Refinement workflow? While every study can benefit from increased data accuracy, this workflow is especially useful for analyses that are concerned with how many copies of each variant an individual has (e.g. in the case of loss of function) or with the transmission (or de novo origin) of a variant in a family. 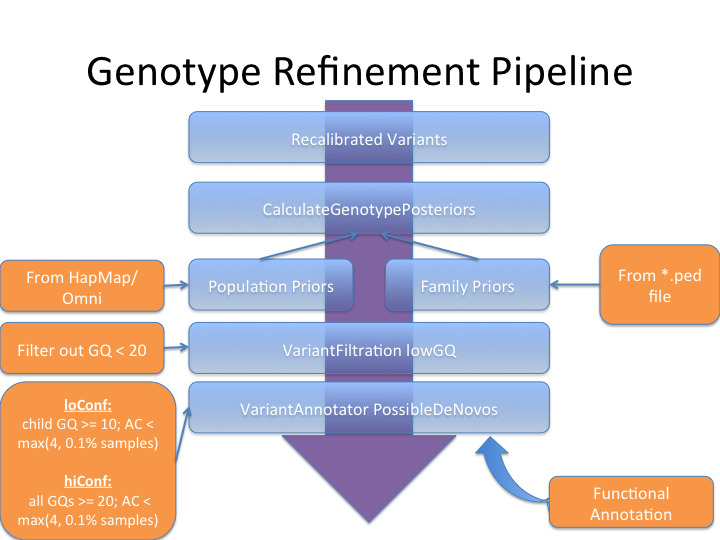 What additional data do I need to run the Genotype Refinement workflow? If a “gold standard” dataset for SNPs is available, that can be used as a very powerful set of priors on the genotype likelihoods in your data. For analyses involving families, a pedigree file describing the relatedness of the trios in your study will provide another source of supplemental information. If neither of these applies to your data, the samples in the dataset itself can provide some degree of genotype refinement (see section 5 below for details). Is the Genotype Refinement workflow going to change my data? Can I still use my old analysis pipeline? After running the Genotype Refinement workflow, several new annotations will be added to the INFO and FORMAT fields of your variants (see below), GQ fields will be updated, and genotype calls may be modified. However, the Phred-scaled genotype likelihoods (PLs) which indicate the original genotype call (the genotype candidate with PL=0) will remain untouched. Any analysis that made use of the PLs will produce the same results as before. Begin with recalibrated variants from VQSR at the end of the best practices pipeline. The filters applied by VQSR will be carried through the Genotype Refinement workflow. Using the Phred-scaled genotype likelihoods (PLs) for each sample, prior probabilities for a sample taking on a HomRef, Het, or HomVar genotype are applied to derive the posterior probabilities of the sample taking on each of those genotypes. A sample’s PLs were calculated by HaplotypeCaller using only the reads for that sample. By introducing additional data like the allele counts from the 1000 Genomes project and the PLs for other individuals in the sample’s pedigree trio, those estimates of genotype likelihood can be improved based on what is known about the variation of other individuals. SNP calls from the 1000 Genomes project capture the vast majority of variation across most human populations and can provide very strong priors in many cases. At sites where most of the 1000 Genomes samples are homozygous variant with respect to the reference genome, the probability of a sample being analyzed of also being homozygous variant is very high. After the posterior probabilities are calculated for each sample at each variant site, genotypes with GQ < 20 based on the posteriors are filtered out. GQ20 is widely accepted as a good threshold for genotype accuracy, indicating that there is a 99% chance that the genotype in question is correct. Tagging those low quality genotypes indicates to researchers that these genotypes may not be suitable for downstream analysis. However, as with the VQSR, a filter tag is applied, but the data is not removed from the VCF. Using the posterior genotype probabilities, possible de novo mutations are tagged. Low confidence de novos have child GQ >= 10 and AC < 4 or AF < 0.1%, whichever is more stringent for the number of samples in the dataset. High confidence de novo sites have all trio sample GQs >= 20 with the same AC/AF criterion. Especially in the case of de novo mutation detection, analysis can benefit from the functional annotation of variants to restrict variants to exons and surrounding regulatory regions. The GATK currently does not feature integration with any functional annotation tool, but SnpEff and Oncotator are useful utilities that can work with the GATK's VCF output. 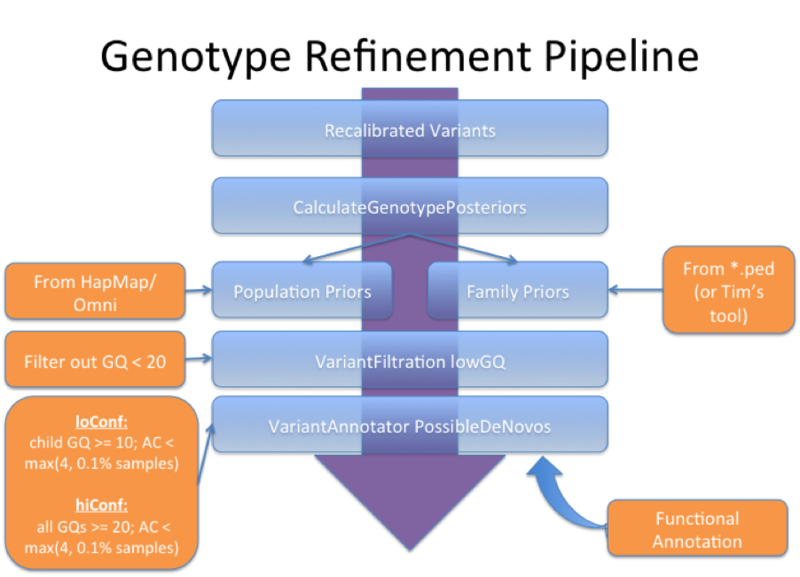 The Genotype Refinement Pipeline adds several new info- and format-level annotations to each variant. GQ fields will be updated, and genotypes calculated to be highly likely to be incorrect will be changed. The Phred-scaled genotype likelihoods (PLs) carry through the pipeline without being changed. In this way, PLs can be used to derive the original genotypes in cases where sample genotypes were changed. New INFO field annotation PG is a vector of the Phred-scaled prior probabilities of a sample at that site being HomRef, Het, and HomVar. These priors are based on the input samples themselves along with data from the supporting samples if the variant in question overlaps another in the supporting dataset. New FORMAT field annotation PP is the Phred-scaled posterior probability of the sample taking on each genotype for the given variant context alleles. The PPs represent a better calibrated estimate of genotype probabilities than the PLs are recommended for use in further analyses instead of the PLs. Current FORMAT field annotation GQ is updated based on the PPs. The calculation is the same as for GQ based on PLs. where the GLs are the genotype likelihoods in [0, 1] probability space. where the GPs are the genotype posteriors in [0, 1] probability space. New FORMAT field filter lowGQ indicates samples with posterior GQ less than 20. Filtered samples tagged with lowGQ are not recommended for use in downstream analyses. New INFO field annotation for sites at which at least one family has a possible de novo mutation. Following the annotation tag is a list of the children with de novo mutations. High and low confidence are output separately. The original call for the child (first sample) was HomRef with GQ0. However, given that, with high confidence, one parent is HomRef and one is HomVar, we expect the child to be heterozygous at this site. After family priors are applied, the child’s genotype is corrected and its GQ is increased from 0 to 49. Based on the allele frequency from 1000 Genomes for this site, the somewhat weaker population priors favor a HomRef call (PG=0,8,22). The combined effect of family and population priors still favors a Het call for the child. The Genotype Refinement Pipeline uses Bayes’s Rule to combine independent data with the genotype likelihoods derived from HaplotypeCaller, producing more accurate and confident genotype posterior probabilities. Different sites will have different combinations of priors applied based on the overlap of each site with external, supporting SNP calls and on the availability of genotype calls for the samples in each trio. If the input VCF contains at least 10 samples, then population priors will be calculated based on the discovered allele count for every called variant. Priors derived from supporting SNP calls can only be applied at sites where the supporting calls overlap with called variants in the input VCF. The values of these priors vary based on the called reference and alternate allele counts in the supporting VCF. Higher allele counts (for ref or alt) yield stronger priors. The strongest family priors occur at sites where the called trio genotype configuration is a Mendelian violation. In such a case, each Mendelian violation configuration is penalized by a de novo mutation probability (currently 10-6). Confidence also propagates through a trio. For example, two GQ60 HomRef parents can substantially boost a low GQ HomRef child and a GQ60 HomRef child and parent can improve the GQ of the second parent. Application of family priors requires the child to be called at the site in question. If one parent has a no-call genotype, priors can still be applied, but the potential for confidence improvement is not as great as in the 3-sample case. Right now family priors can only be applied to biallelic variants and population priors can only be applied to SNPs. Family priors only work for trios. Hi @Geraldine_VdAuwera, I'm trying out this new genotype refinement pipeline and looking at a trio. In the documentation above, you mentioned that high- and low-confidence de novo mutations should be annotated in the INFO field of the output VCF. But what is the annotation exactly? I'm trying to figure out how to filter my VCF file to look for these, but not exactly sure what to filter on. Thanks in advance for any help as always! The annotation module is PossibleDeNovo which annotates either "hiconfdenovo" or "loconfdenovo" to possible de novo mutations. Oh great, even better. thanks! Is performing genotype refinement on samples called with the gVCF workflow likely to be productive or have these features been incorporated into GenotypeGVCFs? Genotype refinement is an add-on that provides functionality not performed by GenotypeGVCFs. if i wish to proceed with phasing and imputation, would you recommend going through genotype refinement first? Sounds obvious but curious why it's not best practices and seems more optional? 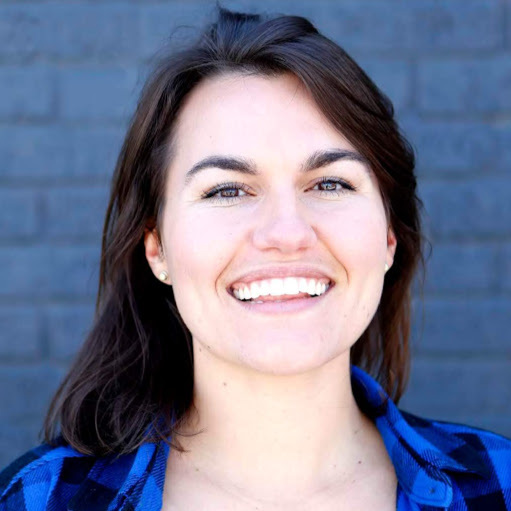 Hi @Geraldine_VdAuwera, thanks for the detailed workflow! In the calculation of family priors, under no MV, the probability is calculated as 1-10u-2u^2. I wonder where the number 10 and 2 come from. Thanks for the answer in advance! I think Geraldine has responded here. For this genotype refinement workflow, only step 1 and 2 are applicable to population data (unrelated individuals)? And after step 2, how can I exclude genotypes annotated as "lowGQ"? 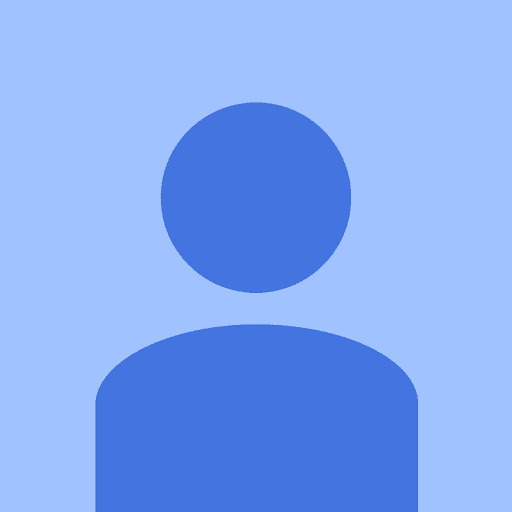 Do you want to remove the sites with LowGQ or simply set them to no-calls? You should be able to use SelectVariants to do either. I wanted to ask one question regarding calculating the population prior. In the article https://www.broadinstitute.org/gatk/guide/article?id=4727, it is recommended to use the phase 3 dataset from thousand genomes for calculating the population prior as shown below. The samples that I am dealing with currently exclusively deals with East Asian samples. Would you recommend filtering the phase 3 vcf file for samples with allele frequencies from the EAS population and using this filtered VCF file as input for GenotypeRefinement? @sjin_lee09 Yes you should definitely subset the frequency resource to contain only the AF information that is appropriate for your specific population. I used the GATK best practice workflow for variant discovery (with the last step being VariantRecalibrator and ApplyRecalibration for SNPs and Indels separately). I ended up with a single VCF for the family trio (I didn't filter out LowQual variants based on the FILTER column) and I then moved to the genotype refinement workflow, where I followed the three steps recommended (Derive posterior probabilities of genotypes, Filter low quality genotypes and Annotate possible de novo mutations). Would the next logical step be removing the LowQual variants based on the FILTER column? Sorry for the delay. To answer your question, it really depends on what you're trying to do. You have to decide what you want to consider as possible variants, (rare variants vs shared variants), and base your filtering on that. Hy everyone, I would like to know, if it is correct to use the Genotype Refinement process, in order to analyze a multi species study of mouse? I guess that I have to use the option --skipPopulationPriors and --skipFamilyPriors, because it is neither populatio, nor familly? We have not tested this procedure on non-human data, and without more information on your experimental design, it's impossible to give you a definitive answer. My main worry is that I'm not sure how the multi-species population structure would affect results. Specifically, I would be concerned that if the group of samples do not constitute a population, nor families, then there is not really anything coherent for the tool to use as basis for refining genotypes. If you can identify sub-populations of 10 samples or more that are coherent, you can run them through refinement separately. No need to provide either argument though -- family priors are automatically skipped if you don't provide a pedigree, and in this case figure you do need the tool to look at population frequencies. But if you can't do that, then I would recommend just skipping this step entirely. Is it acceptable to apply this step after hard-filtering instead of VQSR? Does it matter how big your input dataset is? Yes, you can apply this after hard-filtering instead of VQSR. It does not matter how big your dataset is as long as you have a good truth dataset or family information. However, if you do not have either of those it will be useful to have many samples in your dataset so those samples can help derive accurate priors. I do not have trio samples. All my samples are independent samples. I have an exome pipeline bwa+Haplotype caller pipeline that follows your Best Practice Recommendations . Would this Genotype Refinement add additional benefit to my existing pipeline ? In our clinical lab, We have a bwa+HaplotypeCaller pipeline (Best Practice Recommendations) for exomes, and the pipeline implements Hard Filtering and it does not use VQSR as our expected sample count is less than 30. We also do not do Trios. 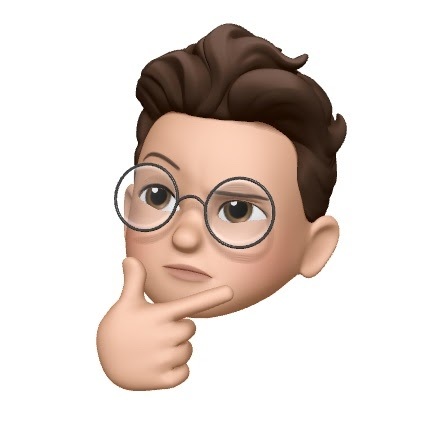 I know that you recommend importing extra samples from 1000 Genomes Project for padding the 30 sample count limit, and it requires us to choose samples with same platform (i.e. technology, capture, read length, depth) and similar ethnicity. We could select padding samples from 1000G with same technology as compared to the technology that we use in our lab, but we don't think we can select samples with similar ethnicity as we can't predict the ethnicity of future patient samples that come to our lab. So, we have taken the "Hard Filtering" Approach. In the 1st step of this article "Run the genotype refinement workflow"
, the workflow starts with an output of VQSR 'recalibratedVariants.vcf'. Since the 'genotype refinement workflow' requires the VQSR output as the first input to start with, does this mean we cannot use the 'genotype refinement workflow' ? I am just trying to understand if I can use this "Genotype Refinement workflow" into my pipeline ? @mglclinical For VQSR the technical profile of the samples is much more important than ethnicity, so you could put together a reference panel that covers a wide diversity of origins and have that work well, at least in principle better than hard-filtering. That being said, if you choose to go ahead with hard filtering, you can absolutely run genotype refinement afterward. The input here is written as "recalibratedVariants.vcf" because this was excerpted from a more complete doc that covered our Best Practices pipeline, which applies VQSR for filtering; but it's not a requirement. You could substitute a callset filtered with any other technique. Thank you for the clarification on the input file “recalibratedVariants.vcf”. We don’t do trios, and hence we don’t have family information, so I guess I can skip the Step 3 from the "Run the genotype refinement workflow" that is used for de novo mutations ? I am sorry if I was living under a rock. Is “Genotype Refinement Workflow” currently part of the Best Practice recommendation, even for non-trio samples? What exact sites/variants gets affected due to Genotype Refinement Workflow? a. Does this only affect genotype calls of sites/variants with low confidence or low coverage ? b. Does this not affect genotype calls with high confidence and high coverage, irrespective of what Population Priors (1000G_phase3_v4_20130502.sites.vcf.gz) say ? c. For Example : if there is a Het (Heterozygous Variant) at a specific genomic coordinate with high confidence and high coverage, and the same variant is found to be a Homozygous Variant in Population Priors, then does that original ‘Heterozygous Variant’ gets changed to ‘Homozygous Variant’ in the resulting vcf file (recalibratedVariants.postCGP.Gfiltered.vcf) ? You have recommended @sjin_lee09 to subset the Population Priors file(1000G_phase3_v4_20130502.sites.vcf.gz) to a specific ethnicity that matches the samples that are being processed . Does this mean that the Population Priors file should not be used as is ? And we should subset it to the relevant ethnic population that match the patient samples ? Hah, please don't feel bad. Our docs around this are still a bit more barebones than I'd like. More like an optional "good to do if you can" but not considered a requirement. Let me put it this way: we currently don't run it by default in our production pipeline. Only affects low-confidence genotypes, where we have information that can correct/confirm them. There are a few examples in the slide deck on this step from the last workshop (see Presentations page for link to google drive where they live). Right, the results will be better if you use an ethnically appropriate subset. The tools themselves don't have any logic to recognize what cohort would be appropriate (though this could be added in future). Thank you for your answers to 1,3, and 4. For 2, I am just curious about why 'Genotype Refinement Workflow' is not run by default in your production pipeline ? I'm not sure but I expect it's because it's more project dependent (the controlling logic is harder to boiler-plate) and therefore left up to the receiving researcher to run or not in whatever way is appropriate for their project. Hmm. I am thinking the tools only deal with biallelic sites, but I could be wrong. Can you post a before and after record of a multiallelic site? I'm trying to run the refinement pipeline using GATK4, but I couldn't find VariantAnnotator as part of the 4.0.0.0 release. Is the PossibleDeNovo annotation part of another tools now? The only other tool I could find is FindMendelianViolations, is this the only alternative? As always, thank you very much for the help! VariantAnnotator is being ported over for the next point release. It should be coming out soon. You can keep track of the issue here. Yes, I think those still hold true.